Full Sushi Bar Setup , Sushi Chef. Includes all chopsticks, wasabi, soy and ginger. All specialty rolls will be made for you and your guests upon request FRESH as in a full sushi bar. *These are a sampling of a wide variety of sushi rolls that will be specialized for you for your upcoming event. If you have any special requests, I am happy to accommodate them. Rham and his sushi chefs are available to cater your next special occasion. We are New York and New Jersey’s premier sushi catering service where we bring the sushi bar right to you. 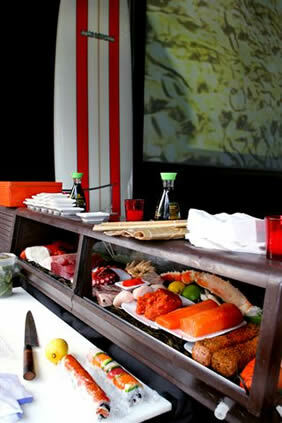 Our custom sushi cart and acclaimed chefs allow you to experience fresh sushi at the location of your choice. The full sushi bar includes a full set up of fresh fish and the finest local produce and ingredients available as well as a specialized sushi chef, chopsticks, wasabi and ginger. All rolls can be specially orders and upon request will be customized for you and your guests to enjoy. You can also chose from the well known Ramasushi specialty rolls that are sure to be a real hit with all of your guests! Whether the event is a wedding, bar mitzvah, birthday party and just a fun bash, make it special with your own private sushi chef. Chose from a variety of platters either from our menu or customized to your preference. Please call 1-917-386-3597 for pricing and availability. Available at our New York City or New Jersey Shore locations all summer long.